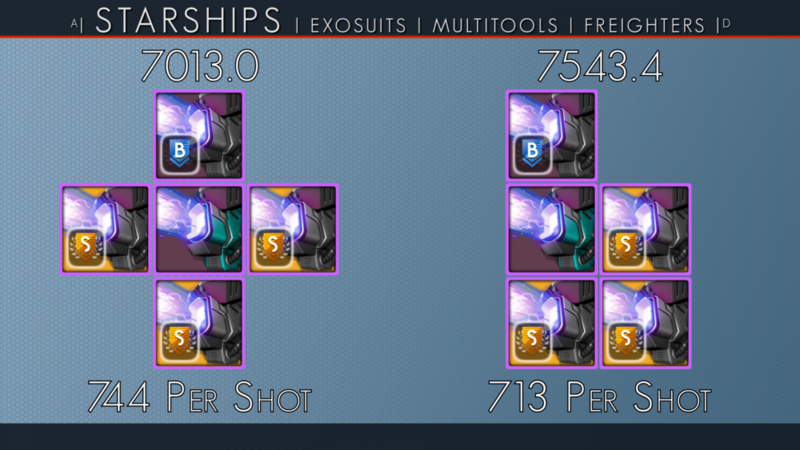 Damage Potential is a stat, it is displayed on the drop-down info panel for your ship when viewing in your inventory, it is not completely useless, but it largely is and I'll prove to you why. No one actually knows how it is calculated, at least, no one has publicly explained it. Most would understandably assume that it is a good marker for how powerful your ship is, but it really isn't, in fact, through my testing, I have found most of the optimized builds show a lower Damage Potential. As far as the proof for how this doesn't show you what is best. Here I have 2 examples. Next, we have a cube with the upgrade touching the main unit, it has 5 connections for a total of 10 potential bonuses, this is per stat involved ofc, and this has a much larger damage potential of 7543.4. The first example has the lowest Damage Potential and hits per projectile for 744. The second has a much larger damage potential yet hits per projectile for 713. For this test all 3 procedural modules had the exact same stats, I know this because the stats a module gets are not linked to the module before it is installed, it doesn't matter which module you decide to instal out of however many you have, whichever you pick will be those stats. You can see this yourself by placing one, noting its stats, then reloading, if you replace it, it will have the same stats, if you have 2 or more modules and pick a different one to place on the reload, it will have the same stats. The Stats of a module run off a seed tied to you, no amount of re-rolling the same upgrade will change it's stats. To get different stats, you must dismantle the old and replace it with another. Any upgrade, however, can be used to push the seed to the next outcome, including other types of that tech and any class of it. I also ensured that the upgrade module was touching only the main unit on both times. This is as it only affects Heat Dispersion, which has an effect on the Damage Potential stat, but not on the damage of a single shot. So while this proves that Damage Potential, is not a good way to judge a layout, it can certainly be used for something. And that is comparing a layout to itself. If you are in the stage where you are min-maxing especially, and basically have the top stats, which means they are rounded up and so won't appear to have changed, your Damage Potential is a much larger number that shows a decimal, so this can be used to see much finer changes. We can assume that the Damage Potential makes some kind of DPS like approach, this is just due to its name. I'd love to solve this mystery, but for the moment, rely on solid in-game testing more than Damage Potential.